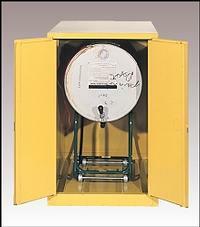 Safely contain a 55 gallon drum of flammable liquids or hazardous waste in the Eagle horizontal drum storage cabinet. Shown with optional horizontal drum dolly (Model E-1918). Available with manual doors (Model E-1928) and self-closing doors FM Approved (Model E-2810). Model E-1957 (Pic. 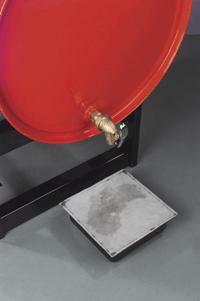 2) - Drum Cabinet Ramp - Heavy duty 11-gauge galvanized steel ramp fits most drum cabinets for easier loading and unloading of drums. 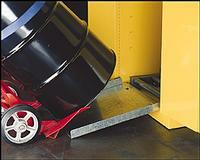 Resists corrosion, and attaches firmly to cabinet door sill for no slip loading and unloading. Dimensions: 4.25"H x 23.25"W x 26.25"L. Weight 28 lbs.